WALCHUK'S WORLD: Riders' Head Coach Dickenson headlines the 13th annual Football Night in Saskatchewan in Yorkton this May! Riders' Head Coach Dickenson headlines the 13th annual Football Night in Saskatchewan in Yorkton this May! 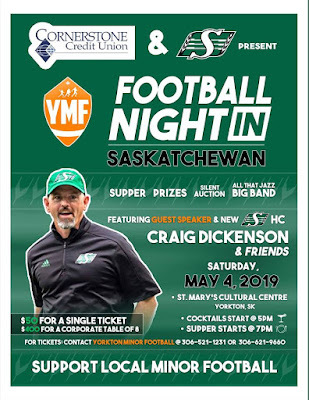 Before taking on his new gig as Head Coach of the Saskatchewan Roughriders this upcoming season, Craig Dickenson will be in Yorkton to speak at the 13th edition of Football Night in Saskatchewan which will take place on May 4th at the St. Mary's Cultural Center in Yorkton. The night is once again presented by the Cornerstone Credit Union, Saskatchewan Roughriders and of course Yorkton Minor Football. Yorkton Minor Football President Roby Sharpe says to get Dickenson is pretty awesome. "Ya we are pretty excited to get him, talking with Craig Reynolds, they say he's just a wonderful guy whose very well spoken and well respected by his players and fellow coaches so we are pretty excited he's coming." As it is each and every year Football Night in Saskatchewan is once again Yorkton Minor Football’s biggest fundraiser and Sharpe says all the funds raise will right back to the football community. Sharpe also add the the night brings alot of the community together. "We got the Adult Jazz band performing, we got the cheerleaders, we got the auction items, we got the speakers, we got some games and all in all its just a fun night to be a part of." Cocktails will begin at 5PM with the supper starting at 7PM. Tickets are $50 per person or you can get a corporate table for $400 and you can get those tickets by contacting Yorkton Minor Football at 306-521-1231 or 306-621-9660.